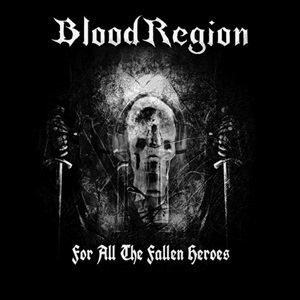 Brandishing their own tag-line of ‘Korpi-Metal’ (your guess as good as mine what that means), the Finnish band Blood Region on their third EP For All the Fallen Heroes appears to embrace a variety of traditional, thrash, and melancholic influences to create something sure to thrill the disenchanted in need of a few alcoholic beverages to carry the blues away. Injecting a mixture of expected electric instrumentation with acoustic embellishment (sometimes mid-song) makes these five tracks dynamically intriguing, even if the material has a straight-forward sheen for the most part. The mystique of latter day Sentenced assuredly hangs in the guitar tone choices and point/counterpoint rhythm supplementation for Mika Minkkinen and Ari Ahonen, while the melodic death harmonies and churning Metallica-ish underpinnings come through on a stellar cut like “In My Father’s Room”, a 5:35 effort containing darker, spoken word passages delivered in a haunting, poetic manner as the tempo builds into a jackhammer, semi-blackened affair. The more traditional, driving chord propulsions for “Heroes” take the listener on a Finnish meets NWOBHM trip, although the rhythm section keeps things a little more power/thrash oriented with their precision and transitions. The bluesy lead break action throughout is a welcome aural experience, as neo-classical or shred exercises would cheapen the potency of the playing at hand. When it comes to the Mika’s vocals, he has this duality to perform in a gritty, hoarse manner for the more aggressive material, but also a lower, clean/gothic manner for a ballad like closer “Across the Dark River” that needs to be explored more, as it has that connective, emotionally touching quality necessary for Blood Region to gain broader appeal without being considered a sellout. Even the 1980’s-like production sheen gives Blood Region separation from the pack. 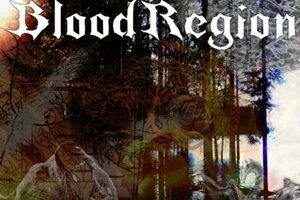 In the end, For All the Fallen Heroes could be one of those hidden gem EP finds for more than most – especially if you dig traditional and gothic/melancholic metal that cuts to the heart.